Bryan Jarboe--Not many people know the delicious history of Peeps. Celebratory seasons are known for seasonal candy favorites. For the Easter season, Peeps are the center candy topic of conversation and reign as the one of the most popular candies of the month. Made out of dyed marshmallows shaped like chicks and bunnies and sprinkled with sugar, Peeps are thought of as a recent creation. However, they have existed in the holiday arena for almost sixty years. With a humble beginning, Peeps were created by a Russian immigrant named Sam Born who was a candy shop owner in New York City. Though his shop opened only seven years after he moved to America, it gained enough popularity to soon transform into a small company. With the transformation from shop to company, Sam Born’s son, Bob Born, called their company Just Born Candies. In 1932, they moved out of New York and into Bethlehem, PA.
As the company continually expanded in the early 1950s, they acquired and merged with another candy company called Rodda Candy Company. Through this gain, Just Born achieved a candy-making tool that would help create the company’s first batch of peeps. This contraption achieved by Just Born was a mold that would allow the company to form marshmallows into different shapes. This mold made it possible for Born’s company to produce and form marshmallow figures into different animal shapes. Most recognizably, it shaped marshmallows into miniature bunnies and chicks for the Easter season. These candy shapes lead the company to a new level of popularity that progressed the Just Born Candy Company to a higher level of superstardom. The first batch of Peeps Marshmallow Candies was created in 1953. A year later in 1954, Just Born started mass producing the candies for seasonal sale. During the 1960s, the company eventually became the biggest marshmallow company in the States as it started to manufacture Peeps candies every spring season. Available in lavender, pink, yellow, blue and white at a rate of 4.2 million a day, seasonal popularity of Peeps gives customers more choices. To this day, Peeps continue to be fan favorite Easter candy. However, the production of this candy has changed. The company now produces marshmallow candies for other holidays, including Valentine’s Day and Halloween. Though the options have increased, Easter Peeps are still the classic treat for the spring. 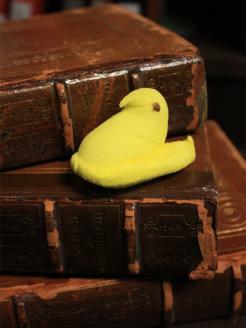 Along with being an edible object, Peeps are a subject of contests. Maryland holds annual ‘Peep Off’ competitions every spring. These are competitions to see who can eat the most Peeps in a given time. Metropolitan areas, including Seattle, WA and St. Paul MN, hold annual Peep diorama contests each year and receive many entries. Whether they are for eating or competing, Peeps serve up spring cheer annually.